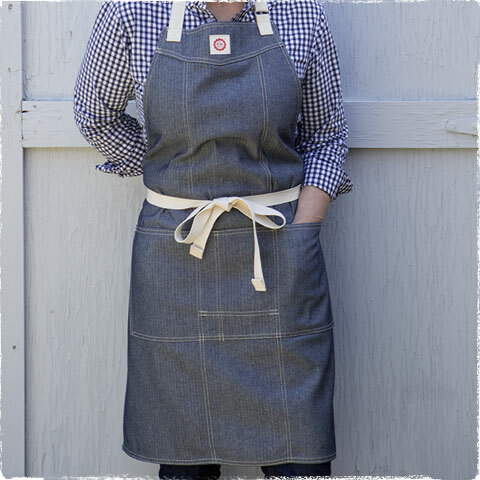 From its fully adjustable neckstrap, to the redesigned bib and large lap pocket, the all-new Demi-Chef Apron was designed literally from a clean sheet of paper. Measuring 33-1/2" high by 27-1/2" wide, the hem falls right at or just above the knee, depending on your height. Extra-long waist straps wrap completely around most people to tie in a bow knot in front. The 3-section pocket is 20" wide by 8" high and holds both hands, a pen or pencil, and smartphone. But best of all, it's available in your choice of a selection of 100% cotton dyed Canvas and Denim fabrics, each with natural-colored, double-needle topstitching. Click for details and to see fabric swatches.